Hello, it's Gina here. 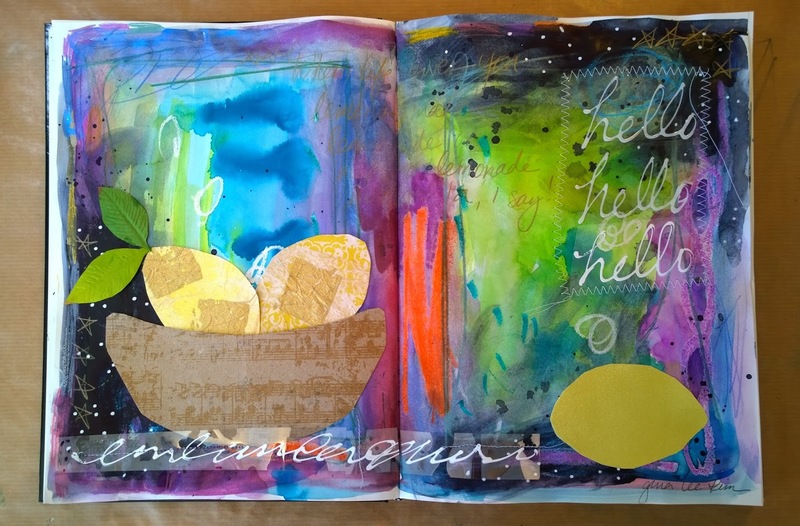 This month's sketchbook challenge is all about "Sketching with Collage". 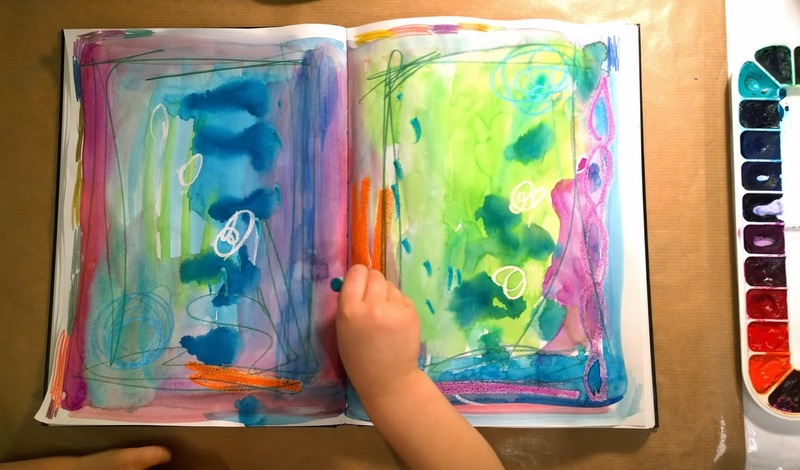 Instead of gradually adding color, I (with the help of my two-year-old) went crazy with a fun, bold abstract background first. 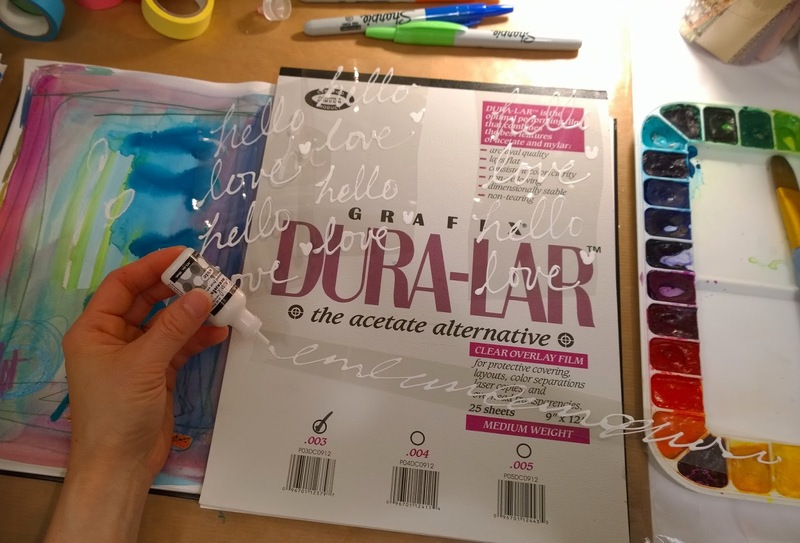 I took some Grafix Dura-Lar acetate film and made transparent collage sheets with handwritten text on them. I used white Ranger Enamel Accents, which is a dimensional faux enamel that dries to an opaque gloss finish. Set aside to dry. 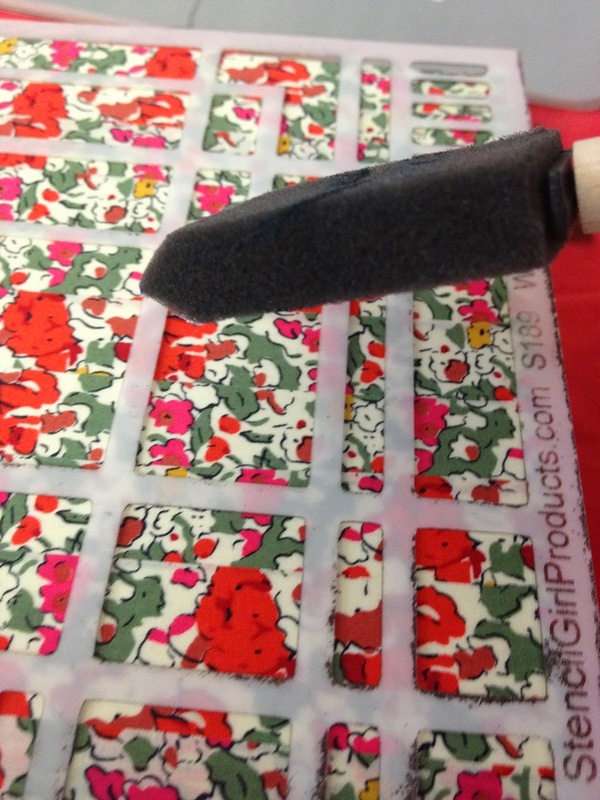 TIP: You could use anything transparent cut to size like cellophane bags, overhead transparency sheets, page protectors, and clear ziplog bags. I've even used recycled envelop windows! I then squeezed out some indigo watercolor (Daniel Smith brand). Placing dark neutrals here and there added contrast to my composition. 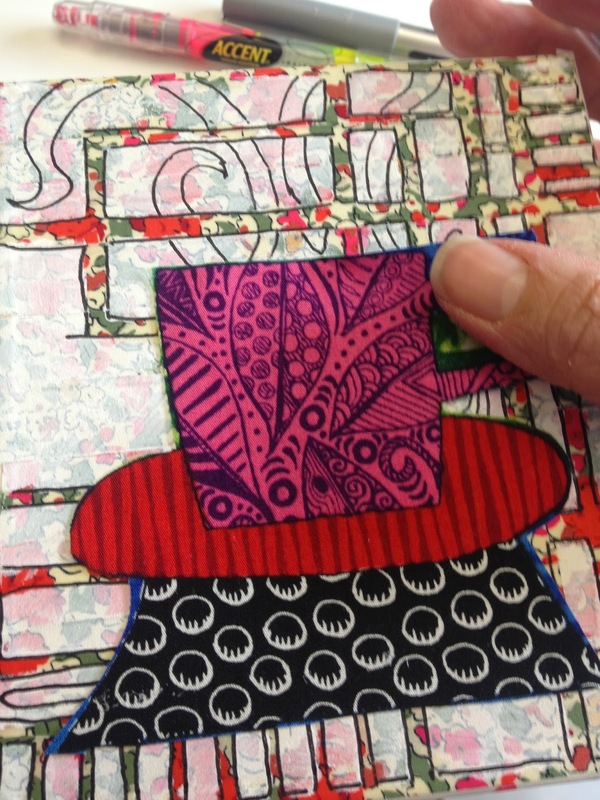 I carefully sewed the transparent collage elements onto my sketchbook page. 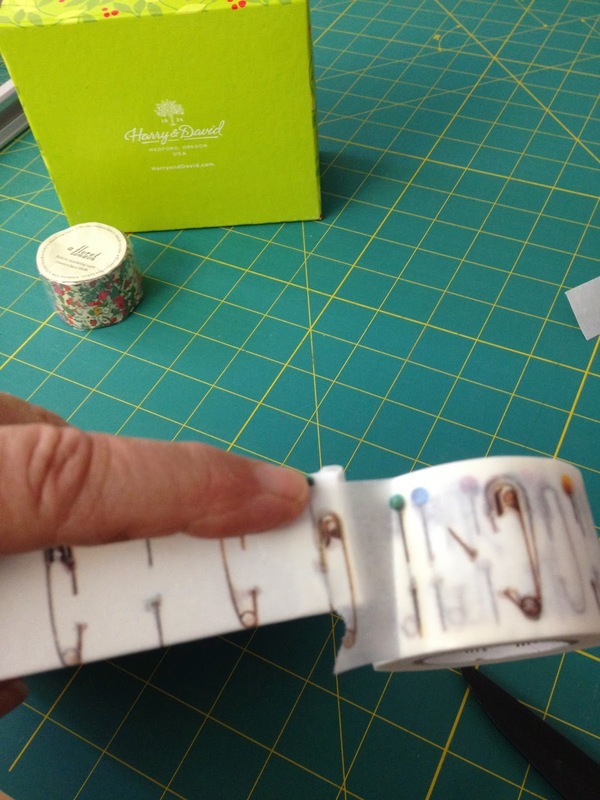 TIP: Tiny double-sided tape helped anchor loose pieces before stitching them down. The citrus family was calling out to me. I cut out some lemons and a fruit bowl from various commerical scrapbook paper. I added a leaf or two. This still-life is my interpretation of sketching with collage. You could barely see the gold metallic pencil writing at top center, but it says: "When life gives you lemons, make lemonade...or lemonade margaritas, I say!" I hope you enjoyed this tutorial and that it inspires you. 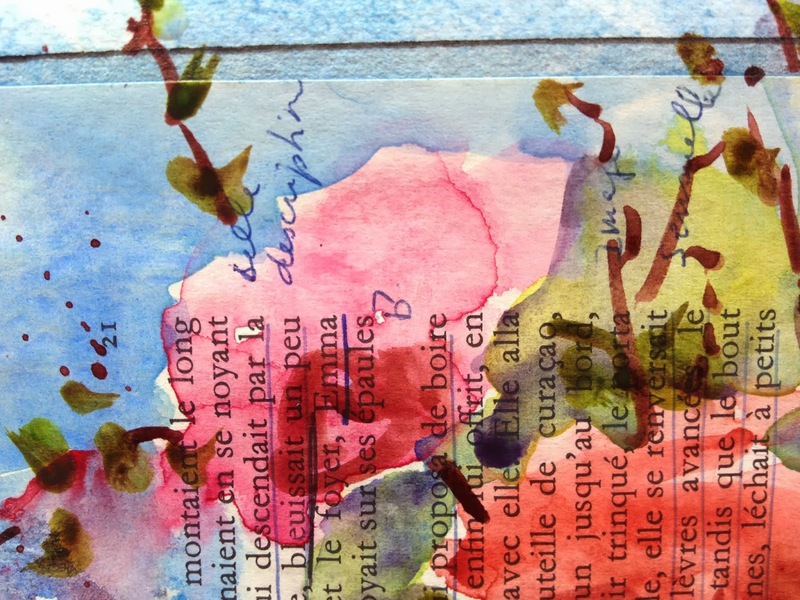 Add zest and interest to your art journals by incorporating transparent collage. And don't be afraid to go bold with your colors. Color invites the inner-child in all of us to come out and play! Goodbye, goodbye, goodbye (for now :). A little paper, some glue, now paint and walla! I decided to do a two page spread in my sketchbook. I taped around the outside edge to leave a white border. The paint ended up seeping under the tape a bit but I liked the look and went with it! When your background paint is dry you can remove the tape if you like. 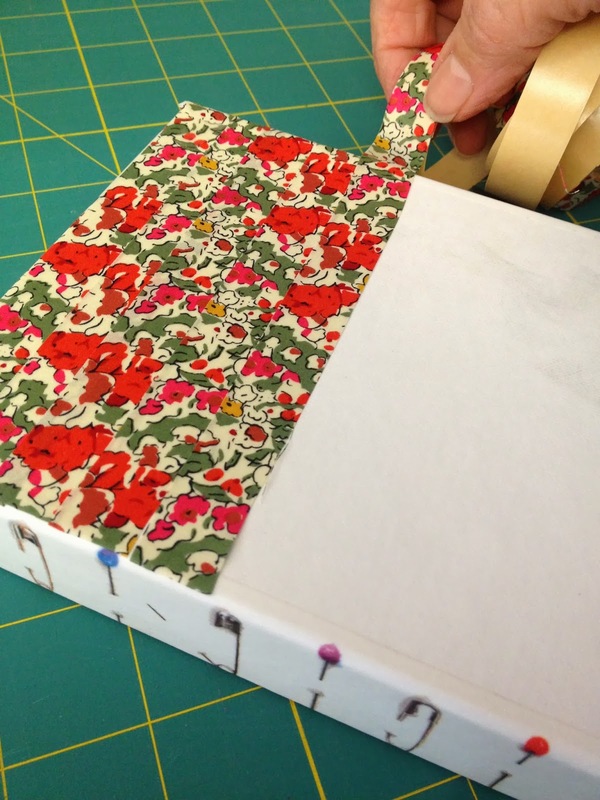 Now take your old book page and rip it up. 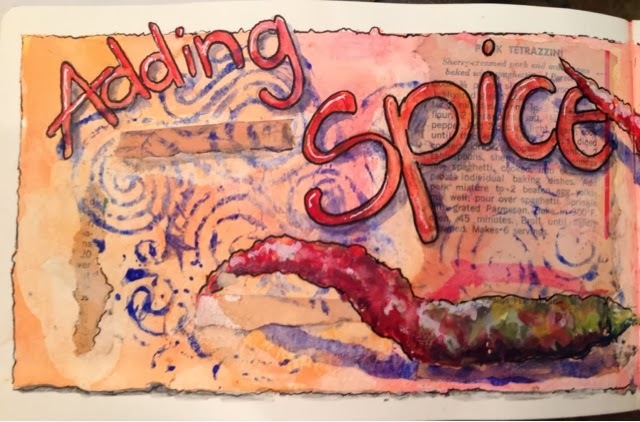 I carefully ripped out recipes and illustrations, then I did some random strips. 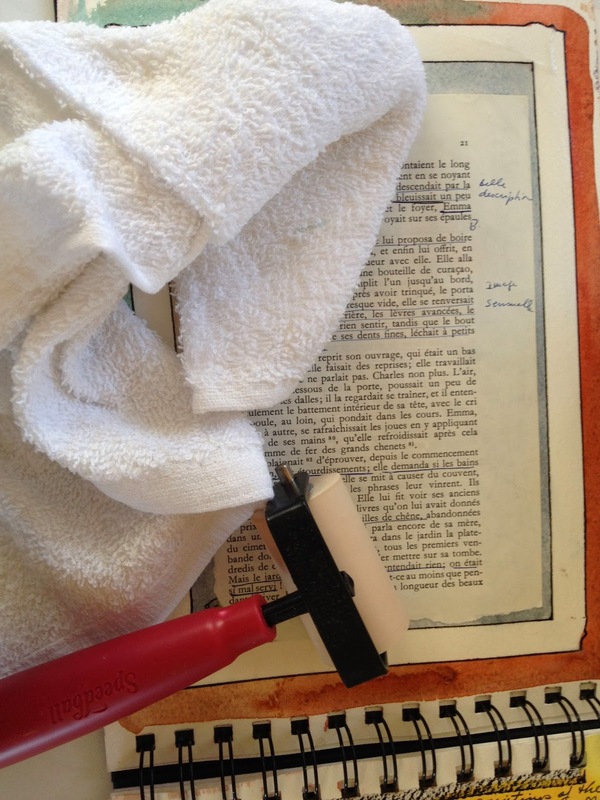 Using a watered down Yes paste or gel medium, glue down your text randomly around your page. TIP: When you are painting shadows remember that shadows touch the object where they touch the surface, when a object is above the paper notice where your shadow is! By making the shadow away from the object you help create the illusion of the object floating above the surface or being bent or curved. Look at the pepper tips too. Choose two colors for your background. I used yellow ochre and red or sienna. Once your glue has dried you can paint your background. I like to add one color of paint then add another. 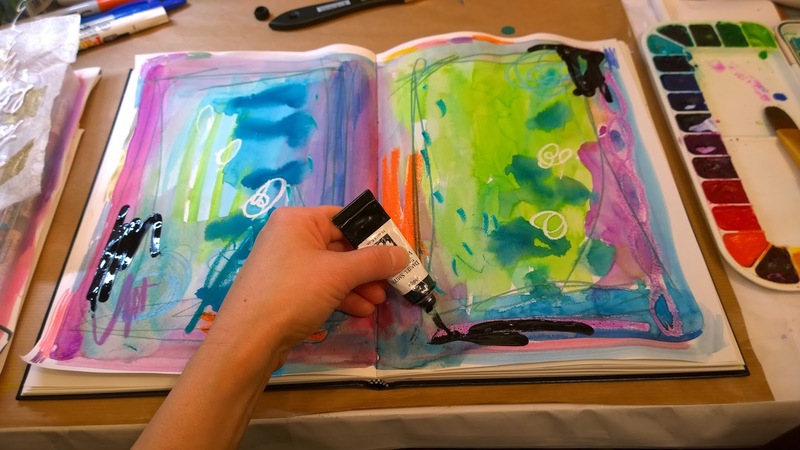 This allows them to blend on the paper and create some wonderful effects. Don't be afraid to add that color all over your background. Now before it's dry take your napkin and blot off in a few areas to give it extra texture. Let it dry. Remember that watercolor dries 20% lighter, if you need to add more color you can later. While your paint is drying set up your silverware and veggie still life. I set up my silverware in different angles to capture the light. 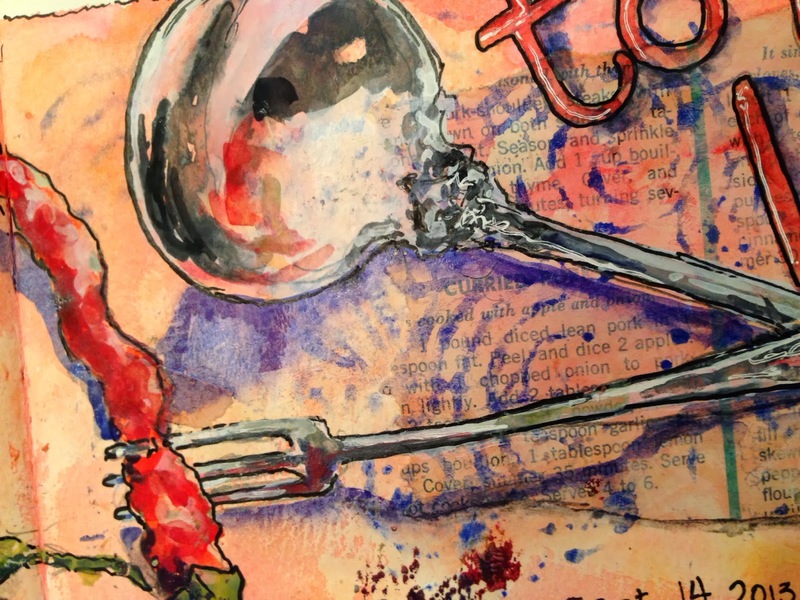 If your paint is dry draw your silverware still life making sure you overlap or connect the images on your page. It's important in any composition that things relate to each other by touching or overlapping. If you don't do this the artwork piece will feel like random objects are just stuck on a page, because they are. 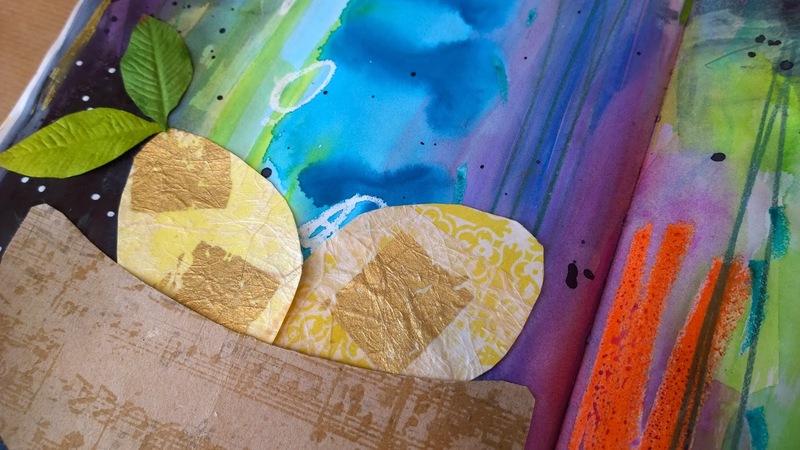 You want to create a rhythm and flow to your piece, one that leads your eye on a journey around your page. That is what happens when things are connected or related. Once happy with your drawings( and they don't have to be perfect), paint them using watercolor. I used paynes grey and some blue and some of my white gouache. 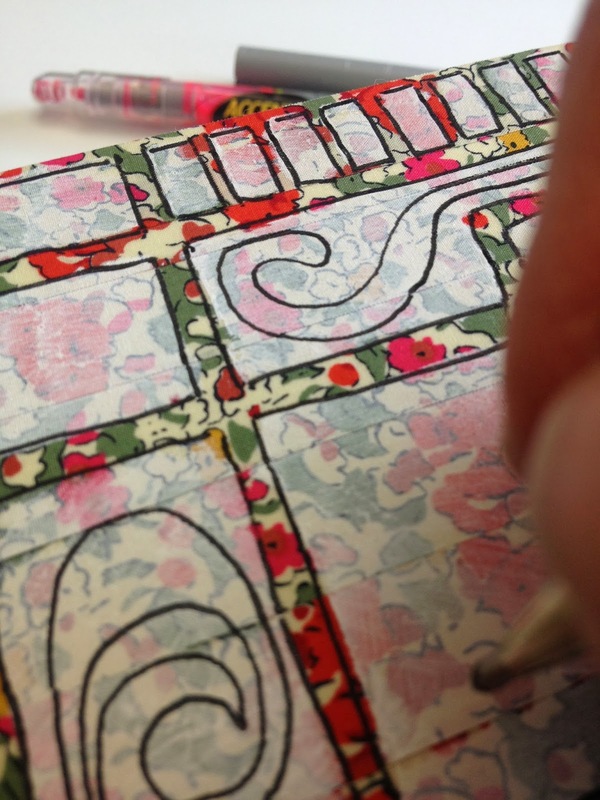 The gouache is opaque watercolor and will change the transparency of the paint. I also always use a paper plate to blend gouache or acrylics with my watercolors so I don't ruin my watercolor palette. Now add some of you grey mixture to the silverware. The get the feeling of silver it's all about the values so once you have your medium grey you need to add really dark darks and white highlights. Since metal is also reflective you can allow some of the color to show through from underneath by wiping away the paint in a few areas or adding your background color and some of your veggies color. 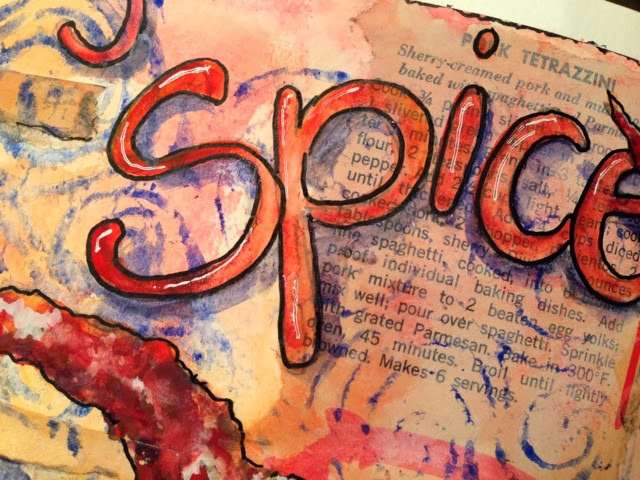 I also added some red gouache to my red Watercolors to give my peppers a more opaque look in areas. 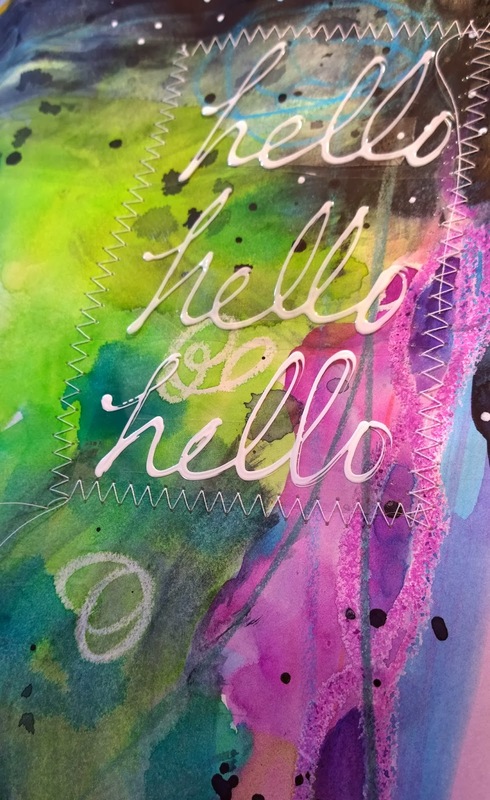 I also chose to add some text to my journaling page which is up to you. I painted the text in watercolor so that the print from the collage shows through. I have my students write about the lesson and the process and what they enjoyed or struggled with. One student wrote she loved the textures but also combining the hard shiny silverware with the organic colors and textures of the hot peppers. To see some of their pages from that day check out our little private blog called Sketchy 5150's ( crazy sketchers)for our class photos. At the end I went back and added some shadows to everything, including some of the paper collages on and to my bordered edges that were jagged lines. It made my background also look like a torn edge of paper by adding shadows and outlines. I then outlined the objects with my pen which is also optional! Don't forget to go back with your white gel pen and add some highlights to the lettering and shiny parts of your silverware. Here is my finished two page spread, I am not crazy about my lettering but I like the rest. I like to take the objects and run them off the painted edge a bit too. Do you notice my shadows? The shadows on the lettering are close but the shadow on the end of the hot pepper above the "e", in the word spice, is away from the pepper creating a floating above or curling up effect. I hope you had as much fun as I did, I knew you could do it! Not scary at all right! Let me know if you have any questions but most important did you have fun??!!! 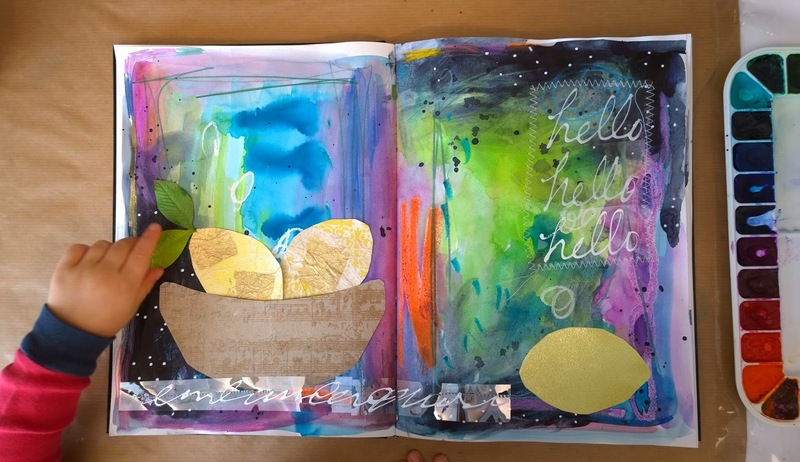 While Leslie Tucker Jenison and Jamie Fingal were having their play date in Jamie's studio, they decided to do a collaboration once a month that coincides with the theme, using a cardboard box. So, Leslie is in San Antonio TX and Jamie is in Orange CA and the text messages go flying - the collaboration begins with a cracker box. 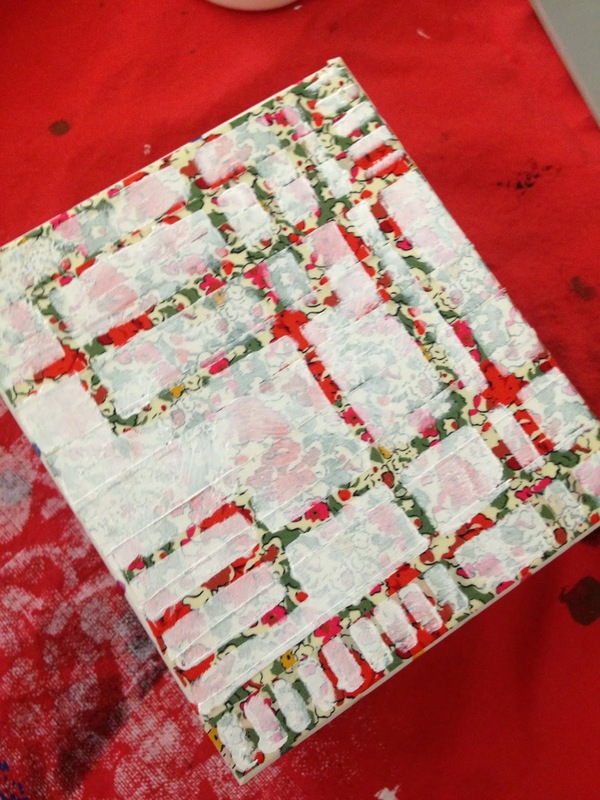 Jamie - I started with an ordinary cracker box, and much to my dismay, no Gesso in the cupboard. 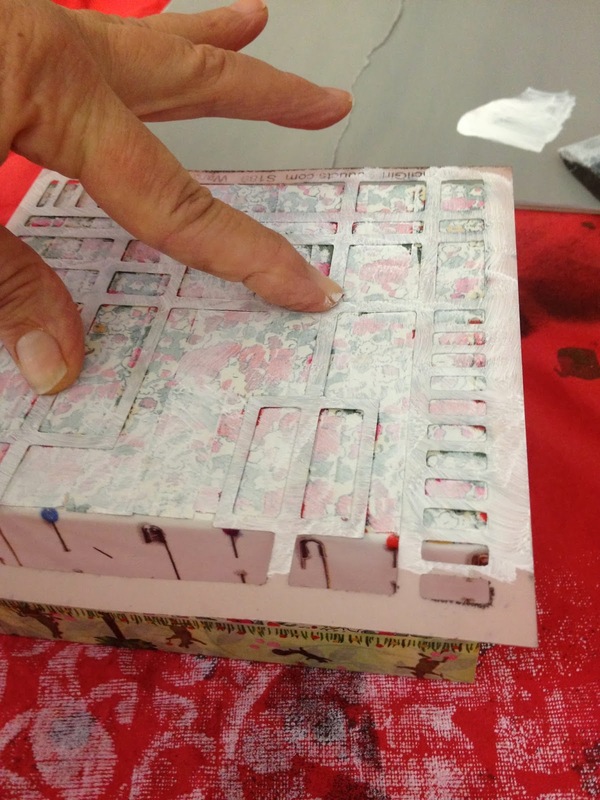 So, I covered the entire box with newspaper using Liquitex Matte Medium, which I am thinking now, was the best solution, because it made the box much stronger. I have long saved this amazing envelope with the bird on it, waiting for just the right project. 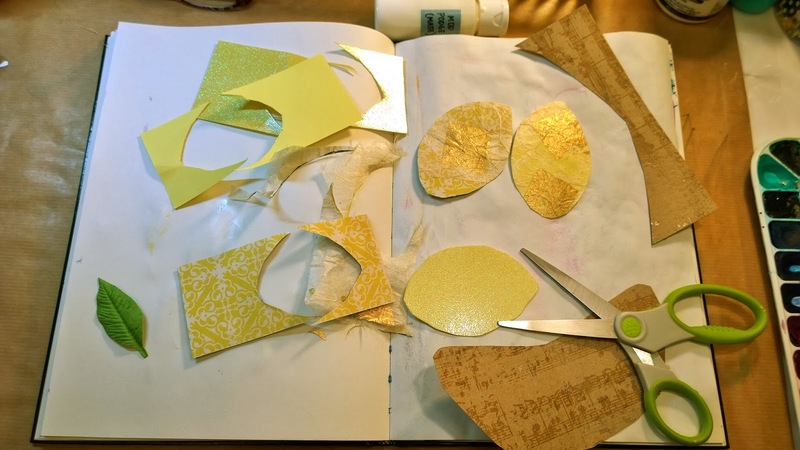 I cut it up, bringing the main focus of the bird for the front, and portions of the envelope for the back. I added some handmade paper, some music notes and another quote. The inspiration for the box theme is all about Hope, in seeing through to a better outlook on life. We always have hope. I added torn pieces of Washi paper. It is very transparent, so I am not really covering up anything, but it adds alot of color and interest to the piece. I attached some music notes and Washi paper to the flaps on top. The back and side of the box, where you can see that I've added some paint lines for a bit of whimsy. I cut off the side flaps, and punch a hole near the top of the front and back flaps. Then I used a black Sharpie to outline some of the stencil lines, so that the colors pop out more. I tied a silk ribbon through the holes and tied a nice bow to finish it off! 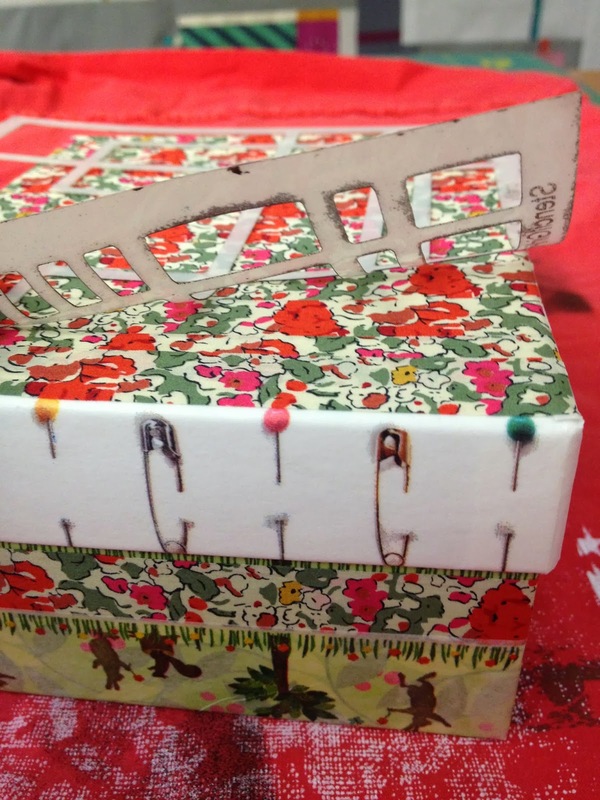 Using washi tape on the sides and over the surface I was able to alter the appearance. 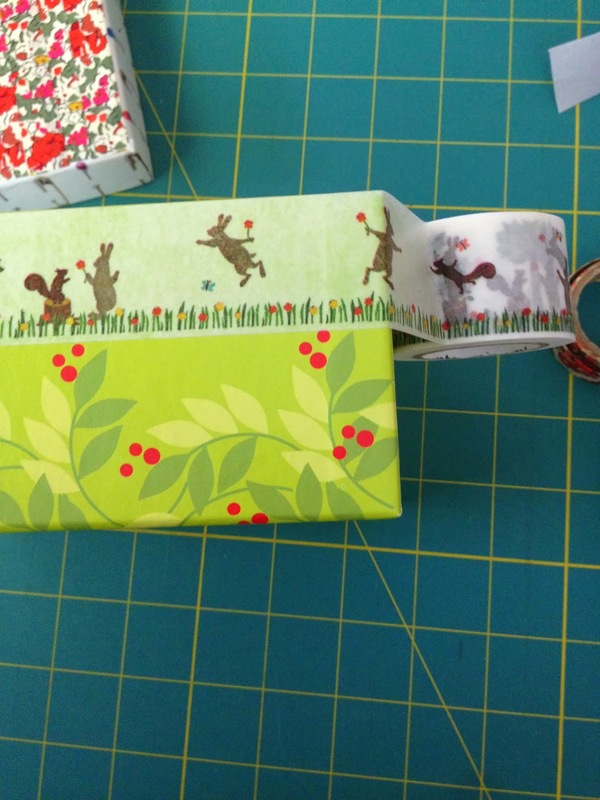 I like the washi tape because it allows a bit of transparency which adds to the look of the box. This is a new role of tape that I found during an Etsy shopping "trip". pounced a layer of opaque white paint into it. 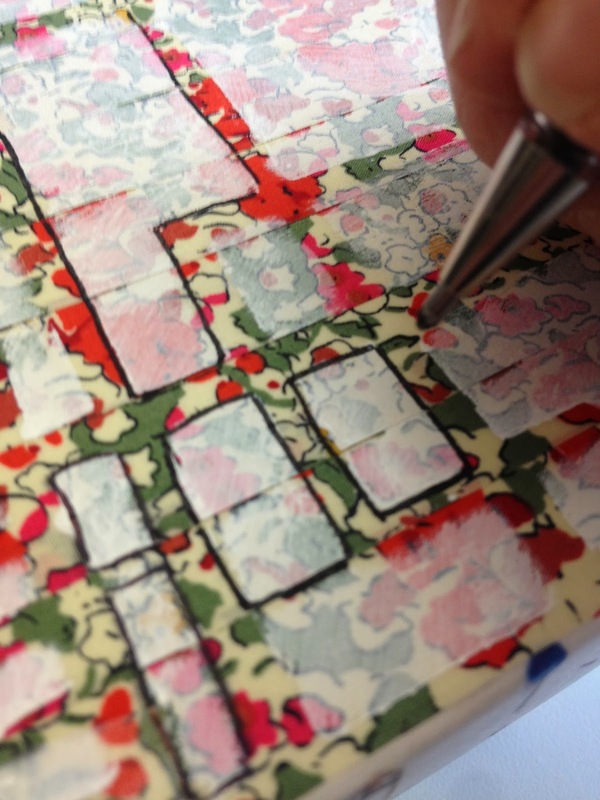 I love the ghosted pattern of the tape under the white paint and the linear openings from the stencil! I drew around the edges of the paint with a black pen. 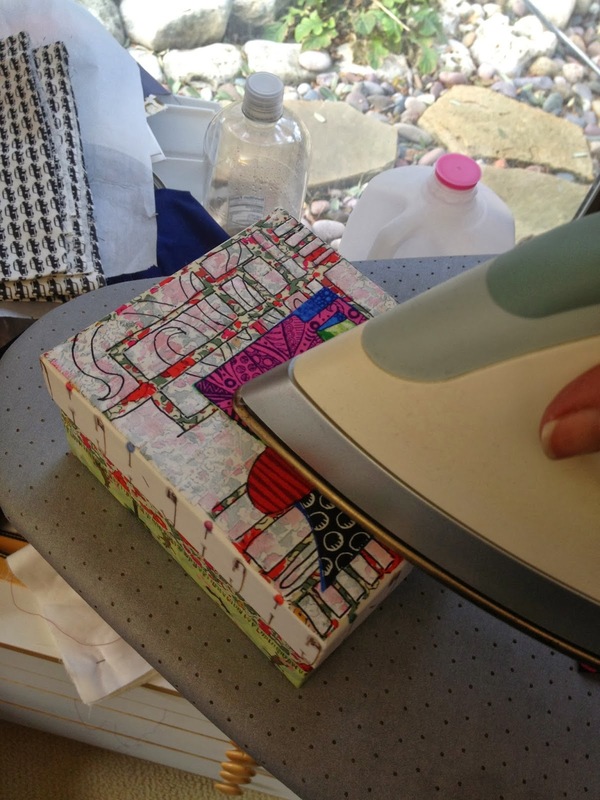 I had a previously cut, fused piece of fabric from Jamie Fingal's new line from Hoffman. box. Since it was a coffee cup it needed some "steam". I wrote a few thoughts about my love of coffee into the "steam". 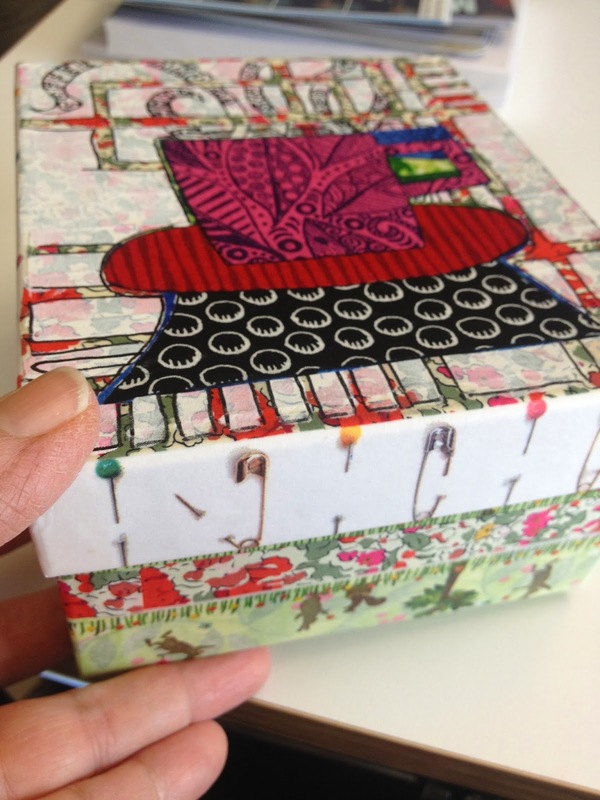 a bit of leftover fabric, and you have a great little collaged gift box that is truly unique. We plan to do boxes that relate to the monthly themes. Hmmm. I wonder what the next one will be?? 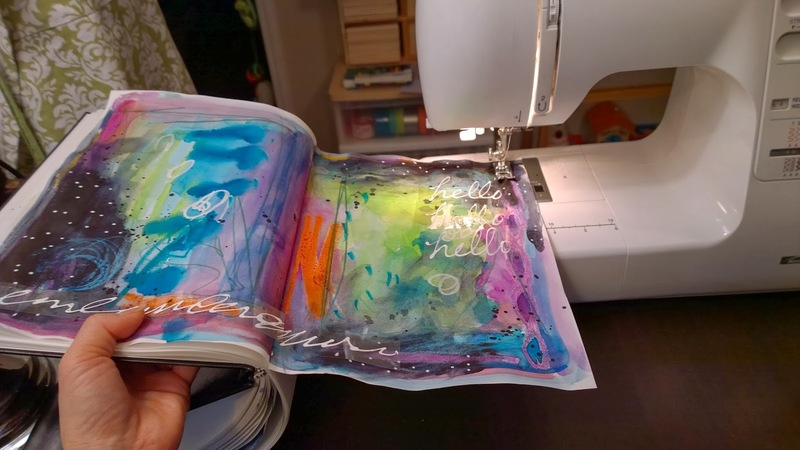 Part of the beauty of being a part of the Sketchbook Challenge is that it can push you to the edges of your "artistic" box. I have to admit that this month's challenge, "Sketching with Collage" was something I wasn't sure what it meant. So I googled it, looked on Pinterest for clues, and watched what the other creative artists posted here on the Sketchbook Challenge. Then I realized that using collage with sketches can involve a wide range ideas and variety art and that I have actually being doing this in my watercolor journals for a long time. 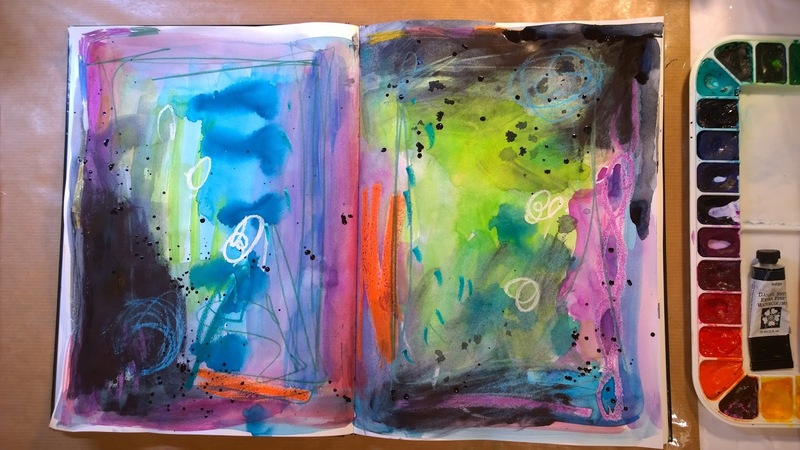 For instance, one of my favorite things to do in my journals is to use book pages in foreign languages as a background for my watercolor paintings. 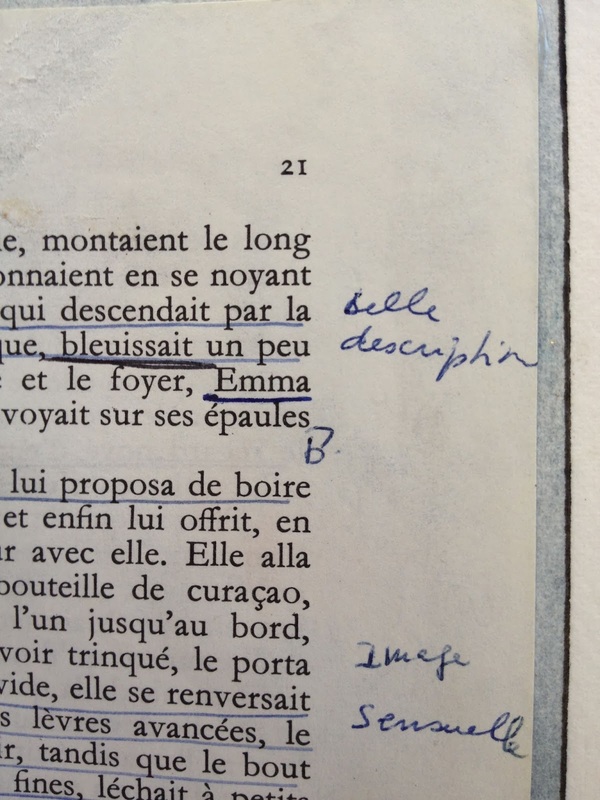 For this page, I started with a page from a French book that my mom used in her studies so it has her notes in the margins of the page. 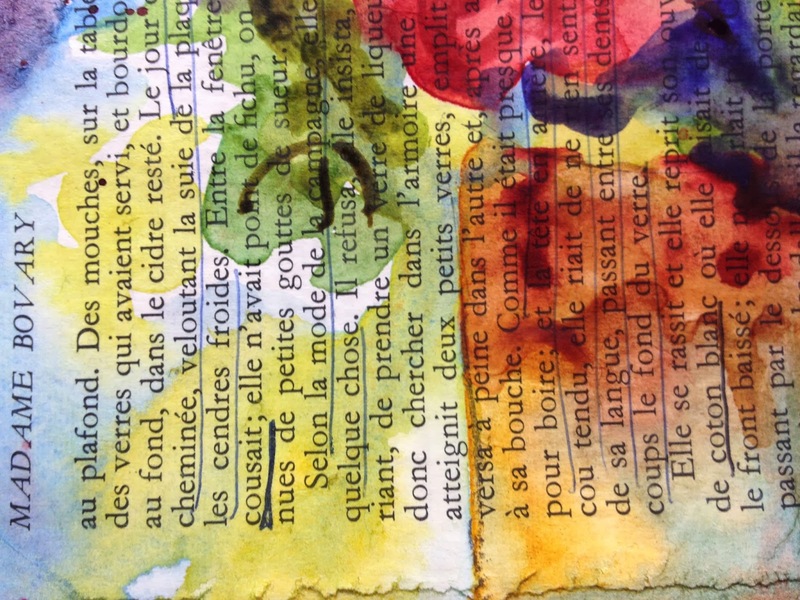 She was a very colorful French lady and I love being able to use her written words in my watercolor journals. 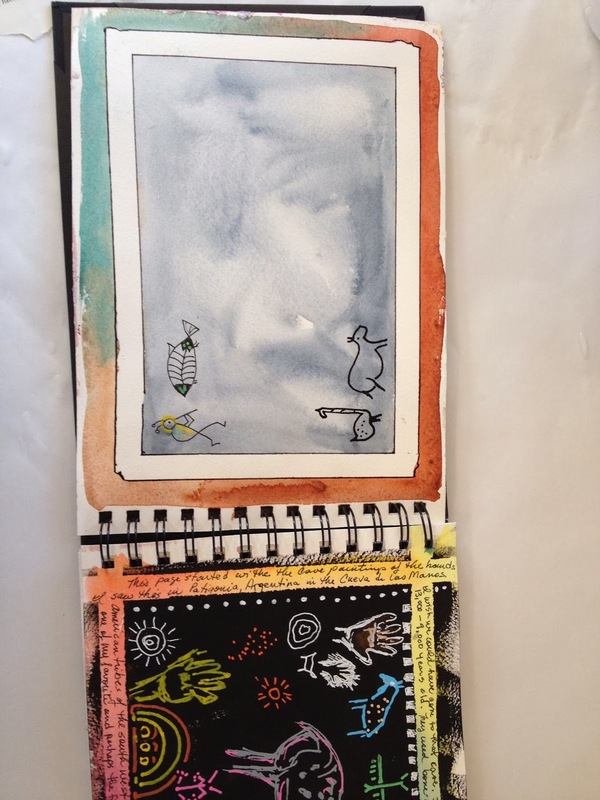 I glued the page out of my mom's book with watered-down YES glue, covering over my upside-down drawings. I feel better already about this page! 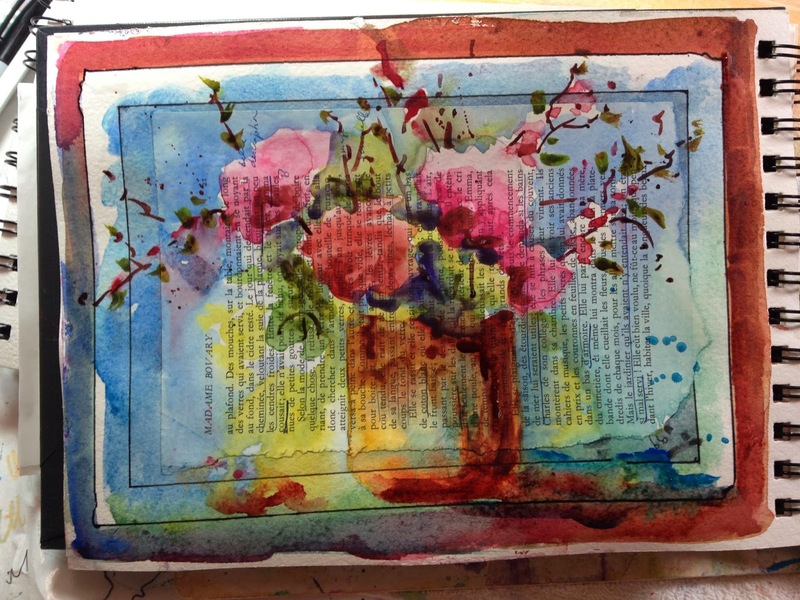 Then I with my watercolors, I painted a pink bouquet of flowers. My mom would have liked the pink flowers. Plus her lovely hand-written words still show through the colors of my painting. Jane LaFazio here. I love combining collage and sketching, it's such an easy and fulfilling way of adding some background interest. For the bird above, I drew with a Tombow water soluble pen, then blended the ink with a waterbrush. My kitty BeBop is clearly drawn to the bird...or not. Another page, with just a bit of old book page as collage. 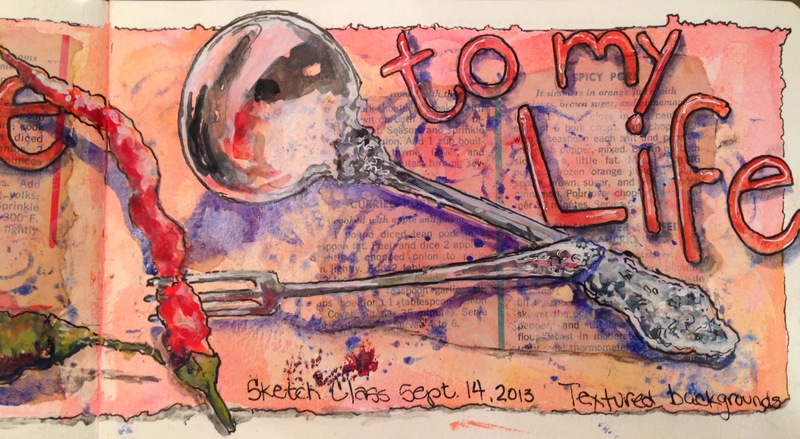 I drew the objects in pencil first, then pen, then painted them with watercolor. I wrote within the shape of the house, to add a bit of texture, then stamped some words, and created 'DREAM" using a letter stencil. 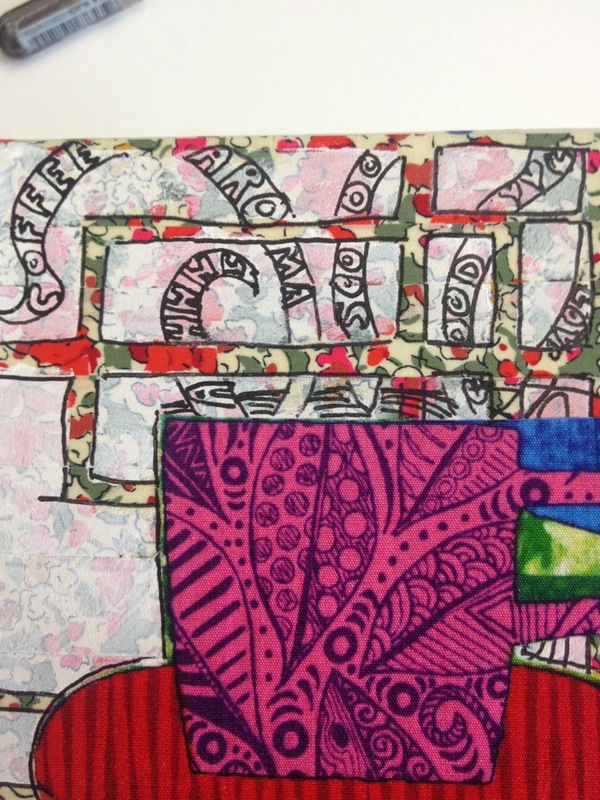 Head over to my JaneVille blog and see how I translated my bird drawing to fabric.